Buy Black Gum Tree For Sale Online. Fast Shipping! The Black Gum Tree, also known as the black tupelo, bettlebung, stinkwood, wild pear tree, and the Pepperidge tree is medium to fast-growing deciduous tree, that grows well in zones 4-9, being able to survive in temperatures as low as -20* F, which encompasses most of North America, along with parts of southern Canada. The medium to large sized oval shaped tree requires full sun to partial shade, (a minimum of 4 hours of direct sunlight), per day. It thrives best in acidic, loamy, moist, sandy, silty loam, and well-drained soil. Black Gum Tree is medium to a large deciduous tree, (growing from 30’-50’ in height and 20’-30’ in width), has alternate yet straightforward leaves that grow from 3”-6” in length, which are ovate/obovate/elliptical. The leaves are incredibly glossy and dark green in the summer and come in spectacular hues of yellows, oranges, reds, and purples during the fall. 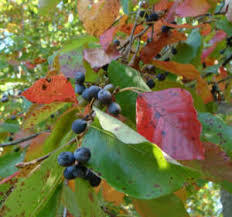 With its light reddish brown, deep furrowed bark that looks like alligator hide, its greenish-white flowers in the early through late spring, its small bluish-black fruit that ripens September through October, and its beautiful array of leaves in the fall to early winter, the Black Gum Tree is considered one of the most favorited natives for all year beauty. Bees and many species of birds thrive on the black gum tree from early to late spring. Black Tupelo is part of the Tupelo family (Nyssaceae). It is a tree that grows slowly or a medium rate and prefers moist, rich, silty loam, sandy, acidic, well-draining types of soil. 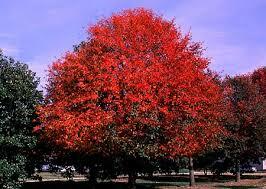 The leaves can vary in color from orange, yellow, purple, or red in the fall. There are flowers, but they are small, and wildlife enjoys the berries which are blue/black. The bark of a Black Gum is in six-sided plates, which makes it unique and thick. The bark is useful for making tool handles, but the tree has a twisted grain to it, so it cannot be split. What is probably little known about the Black Gum Tree is that it is one of the favorite trees, when with other tupelo types of trees, produces honey that is a favorite among honey producers. In addition to wildlife enjoying the berries, bees are provided with food from the Black Gum in early to late spring. The honey is described as mild-tasting and light, which (especially in Florida which does a million dollars annually) sells for a very nice price. Old Black Gum trees that have decayed are hollow and then cut down, creating smaller sections, which are used for beehives. If someone is interested in having a Black Gum as a tree in their landscape, it is best to buy from a trusted local source and one that is a colorful seedling. 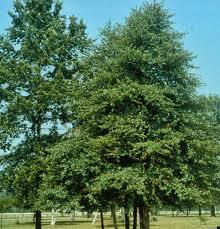 Black Gum trees have a hard time reproducing vegetatively which is why there have not been many selections created. Make sure that you have an excellent location, the right soil, and the correct zone before planting a Black Gum.